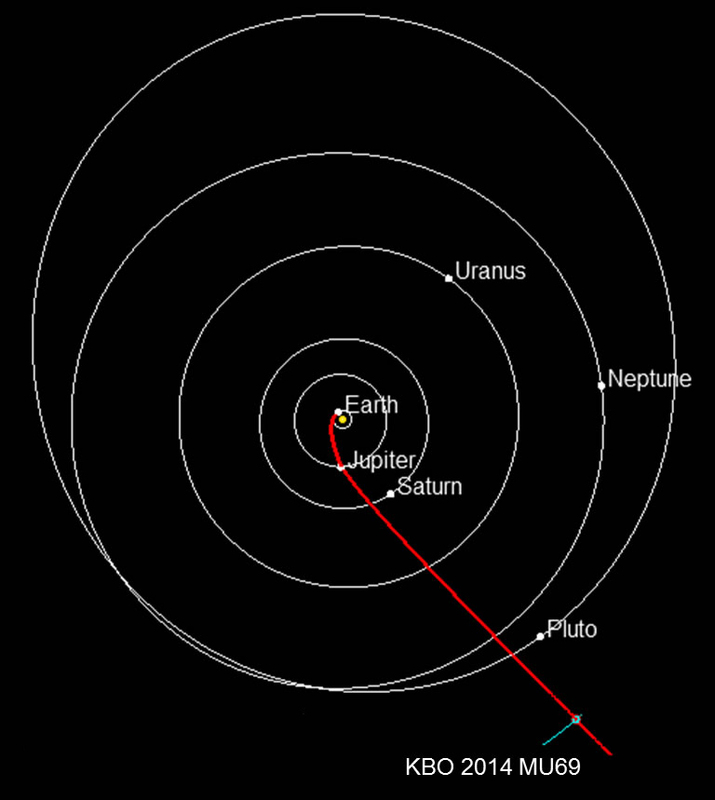 Path to a KBO: Projected route of NASA's New Horizons spacecraft toward 2014 MU69, which orbits in the Kuiper Belt about 1 billion miles beyond Pluto. Planets are shown in their positions on Jan. 1, 2019, when New Horizons is projected to reach the small Kuiper Belt object. NASA must approve an extended mission for New Horizons to study the ancient KBO. NASA's New Horizons spacecraft has successfully performed the last in a series of four targeting maneuvers that set it on course for a January 2019 encounter with 2014 MU69. This ancient body in the Kuiper Belt is more than a billion miles beyond Pluto; New Horizons will explore it if NASA approves an extended mission. The four propulsive maneuvers were the most distant trajectory corrections ever performed by any spacecraft. The fourth maneuver, programmed into the spacecraft's computers and executed with New Horizons' hydrazine-fueled thrusters, started at approximately 1:15 p.m. EST on Wednesday, Nov. 4, and lasted just under 20 minutes. Spacecraft operators at the Johns Hopkins University Applied Physics Laboratory (APL) in Laurel, Maryland, began receiving data through NASA's Deep Space Network just before 7 p.m. EST on Wednesday indicating the final targeting maneuver went as planned. The maneuvers didn't speed or slow the spacecraft as much as they "pushed" New Horizons sideways, giving it a 57 meter per second (128 mile per hour) nudge toward the KBO. That's enough to make New Horizons intercept MU69 in just over three years. "This is another milestone in the life of an already successful mission that's returning exciting new data every day," said Curt Niebur, New Horizons program scientist at NASA Headquarters in Washington. "These course adjustments preserve the option of studying an even more distant object in the future, as New Horizons continues its remarkable journey." "New Horizons is healthy and now on course to make the first exploration of a building block of small planets like Pluto, and we're excited to propose its exploration to NASA,"said New Horizons Principal Investigator Alan Stern, of the Southwest Research Institute in Boulder, Colo.
Getting the data: Following the last in a series of four maneuvers targeting NASA's New Horizons spacecraft toward Kuiper Belt object 2014 MU69, flight controller George Lawrence monitors spacecraft data as it streams into the New Horizons Mission Operations Center at the Johns Hopkins University Applied Physics Laboratory on Nov. 4, 2015. The KBO targeting maneuvers were the mission's largest and longest, and carried out in a succession faster than any sequence of previous New Horizons engine burns. They were also incredibly accurate, performing almost exactly as they were designed and setting New Horizons on the course mission designers predicted. "The performance of each maneuver was spot on," said APL's Gabe Rogers, New Horizons spacecraft systems engineer and guidance and control lead. The first three maneuvers were carried out on Oct. 22, 25 and 28. At the time of yesterday's maneuver, New Horizons, speeding toward deeper space at more than 32,000 miles per hour, was approximately 84 million miles (135 million kilometers) beyond Pluto and nearly 3.2 billion miles (about 5.1 billion kilometers) from Earth. The spacecraft is currently 895 million miles (1.44 billion kilometers) from MU69. 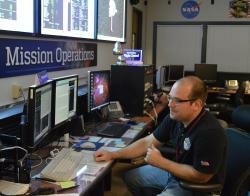 All systems remain healthy and the spacecraft continues to transmit data stored on its digital recorders from its flight through the Pluto system in July. New Horizons is part of NASA's New Frontiers Program, managed by the agency's Marshall Space Flight Center in Huntsville, Alabama. 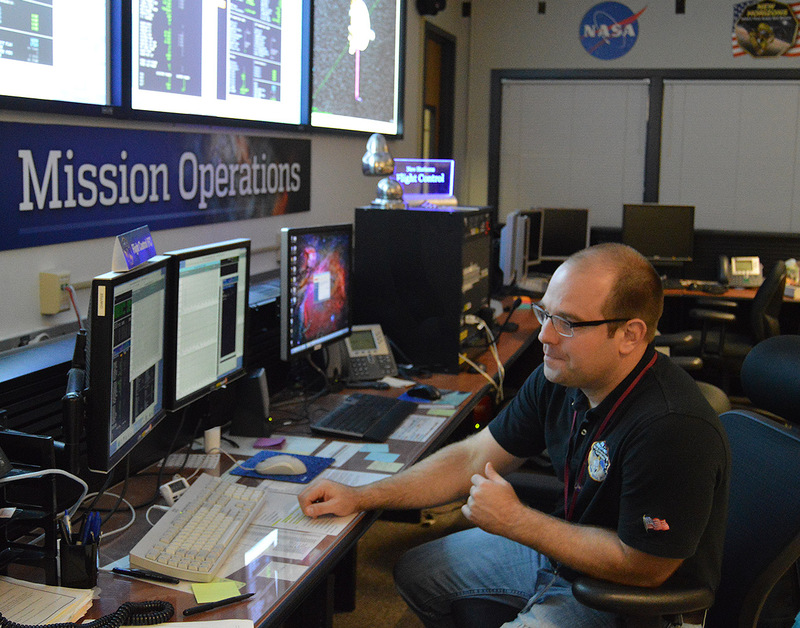 APL designed, built, and operates the New Horizons spacecraft and manages the mission for NASA's Science Mission Directorate. The Southwest Research Institute leads the science mission, payload operations, and encounter science planning.